Historians of the American Civil War have authored an impressive and increasingly complex history of the common soldiers who waged the conflict. Explaining soldiers’ motivations to enlist, charting a steadfast commitment to their respective national causes, unfolding their multifaceted views on race and emancipation, and placing citizen-volunteers within their mid-nineteenth-century contexts, the rich scholarship on soldiering during the Civil War seems remarkably comprehensive. 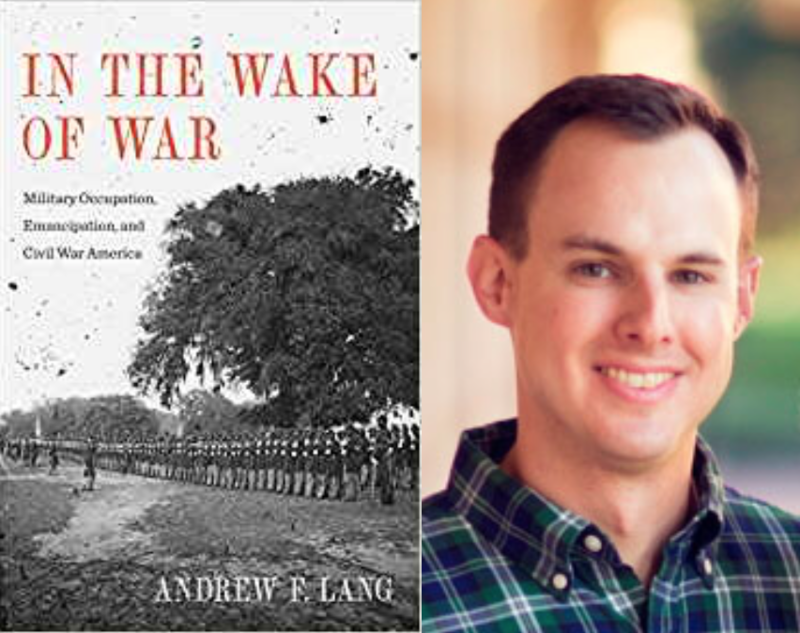 In the Wake of War draws on this resonant scholarly tradition to investigate how United States soldiers understood the era’s wars of military occupation, the layered conflicts waged well beyond the front lines. The book contends that military occupation—a central and contested component of our modern military tradition—is not a dead artifact of the American past. My book engages the perspectives of United States soldiers who served in three separate yet intimately connected military conflicts: the Mexican-American War, Civil War, and Reconstruction. The book thus aims to link the American Civil War to its broader cultural context, revealing how the events of 1861 to 1865 were shaped by a military ethos that preceded secession and which continued to influence the dawn of peace after Appomattox. The book argues for the continuity of republican military culture from which historical actors gauged military occupations against the citizen-soldier tradition and the long-standing fears of standing armies, each of which posed significant implications for the limits of occupation, the composition of volunteer armies, and the processes of state-sanctioned social and political change. In the Wake of War is a book at once about the Civil War Era itself and the long nineteenth century; about the distinctive conditions of the American republic and the United States’ place as part of the Atlantic community of nations; and about the restraints and excesses of modern war. In fact, one can claim that the book is not even about the American Civil War Era at all. Indeed, I wrote the book to investigate the complexities, nuances, and contradictions of the American character, to see the explicit distinctions between the past and present, and to guard against the temptation of hindsight in navigating history. The book embodies my historical philosophy: to understand the past we must create the lost presents in which historical actors lived. Humans have ever only lived in the present, and are thus shaped by context, influenced by contingency, and limited by not knowing how their stories end. In the Wake of War treats the mid-nineteenth-century as a terribly volatile, ambiguous, and contradictory period that was simultaneously influenced by striking cultural continuities. The book engages many historiographies in the corpus of Civil War studies. Approaching military occupation through the eyes of the occupier—rather than the occupied— reveals a war within a war, a conflict fraught with its own unique character and disposition. Wars of occupation were complex, dynamic, and consequential. Exploring how United States soldiers, who reflected the society from which they came, interpreted occupation on both ideological and practical grounds reveals an in-the-ranks perspective on an unprecedented role of American armies in international and domestic wars and crises. The book thus treats military occupation as a lens through which to engage fundamental problems in nineteenth-century America: the relationship between citizen and government; the balance between republicanism and democracy; faith in the exceptional nature of Union; the complications of race in a white republic; the confusing negotiation of gender roles; the limits of free-market capitalism; the boundaries of restricted warfare; the military’s both celebrated and ambivalent place in international affairs and domestic life; the role of standing armies in the American imagination; and the uncertain scope of the federal state in the nebulous transition from war to peace. Two historiographical interventions, I think, stand out prominently. First, the book contributes to a long established conversation on emancipation—particularly Abraham Lincoln’s Emancipation Proclamation—and the enlistment of African American soldiers into Union armies. Race emerged as a central feature of the occupation experience. The book engages how the Proclamation spoke to white anxieties about military occupation, which shaped how African American men were integrated into federal armies and how they designed their own conceptions of military service and the purpose of military force. The mass enlistment of African American soldiers pushed white leaders to define service in auxiliary forces along lines of race. The politics and rhetoric of emancipation served to confine black troops to limited roles, including the “dishonorable” duties of service behind the lines. Yet in so doing, black soldiers emerged on the front lines of occupation, using their newborn martial authority to great advantage in unbalancing white southern power. From the points of their bayonets, African American occupiers destabilized the very society once guilty of their enslavement, underscoring the overwhelming impact of wartime emancipation. On a broader level, In the Wake of War seeks to show how a preponderance of white Americans did not anticipate the exigencies of emancipation in a war for Union. Indeed, emancipation, and the Emancipation Proclamation in particular, emerged as contingent events both for white and black participants, each of whom articulated different understandings of the event’s place in the broader conflict. The second intervention resides in understanding the limited purposes of and the moderate context of Reconstruction. It has long been an understandable fashion for scholars of Reconstruction to condemn the period as an unmitigated failure. And there is little question that the era failed in devastating ways to secure basic civil rights for African Americans. But when writing the book, I was more interested in understanding why Republicans hesitated to employ federal force or to enact a truly robust military occupation to protect the gains of emancipation. I felt it my job to engage Republicans and the United States Army on their own terms rather than offering blanket condemnations of hindsight on that which could or should have been done. We know, as did a minority of white Republicans and a preponderance of African Americans, that civil equality depended on concentrated power to enforce the Fourteenth and Fifteenth Amendments. But a majority of white northerners considered the army’s domestic role in society and politics anathema to the fundamental ideals of republican government. “And herein lay the central irony of Reconstruction,” I write in the book’s final chapter, “the very principles for which the United States went to war in 1861—preservation of the Union’s republican ideals—were the very values that purposely hindered a robust, long-term military occupation from reshaping the postwar nation.” Americans would not tolerate a centralized military establishment managing domestic life, even if in service to a noble cause. My chapters on Reconstruction thus attempt to show the vast gulf in values between the nineteenth century and today. What we find myopic and shortsighted were seemingly rational and self-evident calculations made by white Americans of a bygone era.